Condemnation. Expulsion. Apologies. Teachings on dignity and respect. All before an investigation, or even considering the students’ side of the story. How un-American. How un-Christian. What crappy “leadership.” What rank cowardice. I’m sorry Covington, but WTF did you just say? How about “We’re aware of the incident in Washington, DC involving our students. We are investigating the matter and will take appropriate action. We are grateful everyone involved is safe.” Bam, done. Protects the school, protects the students, acknowledges the seriousness of the situation. But no, you didn’t do that did you? You cut and ran at first contact. As if these young men didn’t have enough to worry about, you know with the death threats and the potential of ruining their chances at going to a good college and everything, now they have to worry that their school is going to kick them out? Covington’s statement is reminiscent of another Catholic debacle, the Spanish Inquisition, but without the inquiring; Covington High simply skipped that part and jumped straight to burning their own people at the stake. Covington’s public statement on this issue references “the Church’s teachings on the dignity and respect of the human person.” But forgiveness was also a fundamental tenet of Catholicism when I was a practicing Catholic. What happened to that, Covington High administrators? Does that not extend to the “cardinal sin” of a racially-charged offense? What happened to protecting and guiding your flock? Where is your compassion, your empathy, your simple human decency? If I was a Covington student, the school wouldn’t have to worry about expelling me, I’d transfer tomorrow, and drop a lawsuit on the principal’s desk on the way out. I wouldn’t want to be part of a school with an administration that is so consumed with Trump Derangement Syndrome and is so risk-averse that they are willing to throw me, my classmates, and our chaperones under the bus like that. If I were a parent of a Covington student, I’d pull my son out immediately. If this reaction is what Covington is teaching my child about how to be a leader and how to handle adversity, he wouldn’t spend another day enrolled. If I were a donor, I’d be calling people right now to recover my gift. Shortly before I sent this article in for publication, I saw on a couple of news sites that Covington High might be contemplating suing on behalf of their students. LOL, really? Now that the smoke has cleared and your boys are exonerated, NOW you grow some balls? That’s even more disgusting than the original offense. We have come to expect a certain kind of behavior from leftists. We have come to expect fake news from the media, especially CNN. But students should expect that their school will have their back, even if they need to be held accountable for misbehavior. Covington did the exact opposite. 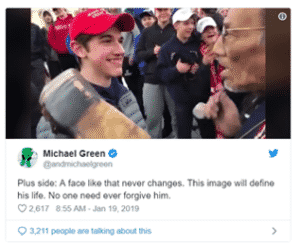 The child at the heart of this situation, who is at the center of a media-manipulated hate hoax event, who has had his future and life threatened, is apparently named Nick Sandmann. I’m naming him only because he issued a public statement acknowledging he is the person in the video, and offering his side of the story. His side is much more in line with the facts. “Pathetic and impotent,” like your attempts to remain relevant by attacking innocent school children? “This is the image that will define his life,” he says. I’m sure it already has, Mr. Green, and you’re one of the people who helped make it that way. You and your ilk tried to ruin this child and destroy his life. Covington High School had to close today because of the threats sent its way by people motivated by the kind of hate YOU helped spread. You say no one “need ever forgive him,” and in that regard you are correct. He needs no forgiveness, because he did NOTHING wrong. But what should you do, Mr. Green, to make up for your part in trying to ruin this young man’s life? I have an idea: offer to pay for his Ivy-league college education. It’s the least a Hollywood multi-millionaire like yourself should do. Maybe you can get all the rest of your hate-filled, bigoted, slanderous West Coast liberal elite buddies to pitch in and make some phone calls to some East Coast liberal elite schools. But maybe he won’t need it; I mean, surely Harvard University is going to offer this young man admission to their erudite halls, just like they did for Parkland survivor, leftist activist, and SAT under-achiever David Hogg, right? RIGHT HARVARD? No? Oh right, I forgot, you only do that for people who support your far-left agenda. Well, unless they’re Asian, I guess, in which case you’re probably not going to admit “too many” of them to your school regardless of their political views. In this situation there are a lot of disgusting cowards who managed to make themselves look like complete idiots at the expense of innocent children. Are you one of them? If so, what are you going to do about it? It’s too late for you to apologize.